If you’re about to welcome your first baby home, congratulations! You’re about to begin the most rewarding journey of all. Of course, it would be disingenuous not to tell you that it’s also the toughest journey you’ll ever undertake. If you’re entering that journey with a disability, it’s going to be even tougher. The good news is that millions of people with disabilities are parents. They’re capable. You’re capable. Here are some tips for making your home ready for that new arrival. Preparing the home for a new baby when disabled. As the weeks pass, your home is going to fill up with stuff. It’s hard to imagine all the things you will need for a new child. Not only that, but general housekeeping tends to get put on the backburner when you have to take care of a child. That’s why it’s vital that you do everything in your power to declutter your home before you begin your parenthood journey. As a parent with a disability, having free and clear pathways throughout your home is paramount. Check out this thorough guide to decluttering. If you have a disability, then the simple fact is that you may be slower to react in the event that something dangerous happens inside your home. It’s important that you make sure your home safety apparatus are functioning properly. Check your smoke alarms. Install additional carbon monoxide detectors (especially near the child’s room). Do you have a fire extinguisher? Good, get another one. It’s not a bad idea to invest in a video surveillance system and/or home alarm system. Beyond that, you’ll need to invest in various cabinet and drawer locks. You’ll also need to round sharp corners with padding and tie up loose electrical cords. Check here for more tips on baby-proofing your home. You can never be too careful. That’s a golden rule. 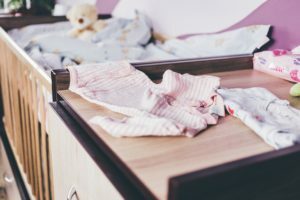 Even if your disability allows you to live comfortably in a multi-level home, it’s probably wise to convert a downstairs room into the nursery/child’s room. It’s simply easier to access that way – and you’ll be in there a lot. There are so many products out there that can help disabled parents – probably more than you even realize. These products are designed to make your life easier and keep your child safer. Some examples include adaptive strollers that can be attached to or easily pushed by someone in a wheelchair; adjustable height high chairs for easier access; various slings and harness that make carrying or nursing a child much easier; side-release cribs and baby beds; and various cameras and baby monitors. Read up on some more options here and here. There’s no rule that says you have to do everything on your own. Having a disability can put added stress on even the most trivial of child care tasks. If there are certain responsibilities that are overwhelming you, consider getting some help. This could mean hiring a housekeeper. It could also mean hiring a part-time or even full-time nanny depending on your mobility. Check out this guide to finding good child care help. Always remember this: you are not disabled parents. You are able parents who happen to have disabilities. Whenever you start to feel overwhelmed and things begin to look hopeless, remember that many have done what you’re doing and have been successful. If you know how to prepare and commit to it, you’ll be just fine.